You know the rhyme, but did you know that it was originally a riddle? 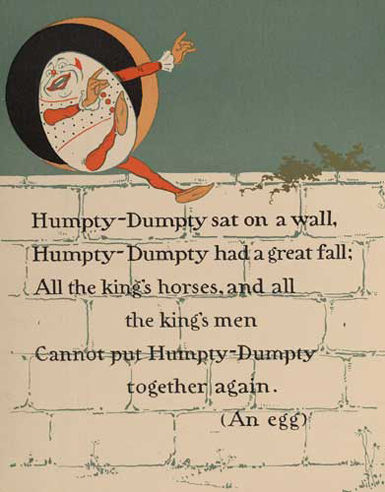 Before the identity of Humpty Dumpty was so well known, children, after hearing this poem, would be asked, “Who is Humpty Dumpty?” They would then have to decipher the clues. What kind of a thing is so fragile that, once it takes a great fall, it cannot be put back together again? The picture above, taken from a 1902 Mother Goose storybook, gives us the answer to this rhyming riddle in parentheses. Humpty Dumpty is an egg. The truth of the human condition is that we all have a bit of Humpty Dumpty in us. We are all more fragile than we care to believe or admit. That is why a stinging comment can cut so deeply. Or a public failure can embarrass so monumentally. Or a broken relationship can hurt so horribly. We are all fragile. The preacher of Hebrews reminds us that there are some who have taken a great fall. But this is not a fall off a wall, this is a fall from faith. The Greek word for “fall away” in verse 6 is parapipto. This is the only place in the New Testament that this word appears. It is from the verb pipto, meaning, “to fall,” and intensified by the preposition para. In other words, it denotes someone who has not just fallen, but fallen hard. They have taken a great fall. The preacher of Hebrews warns that a person who takes such a parapipto cannot be put back together again: “It is impossible…if they fall away, to be brought back to repentance” (verses 4, 6). But this is not because God does not desire to put them back together again. Indeed, he would love nothing more than to see them repent and restored. But these people will have none of God’s restoration. Instead, they violently and vociferously “crucify the Son of God all over again and subject him to public disgrace” (verse 6). The problem, then, lies not in the will of God, but in will of these men. For they do not want to be put back together again. Instead, they rail against God and seek to destroy him. Indeed, the Greek word for “public disgrace” in verse 6 is paradeigmatizo. Like parapipto, this is a compound word consisting of the verb deigmatizo, meaning, “to disgrace,” and then the preposition para which serves to intensify the main verb. These people, then, do not just want to disgrace Jesus, they want to radically disgrace him. They want to subject him and his message to as much scathing ridicule as they can marshal. A question that I am regularly asked about passages like this one is, “How do I know if I’ve fallen away? What if I have taken a great fall, never to be brought back to faith?” My response to each anxious inquiry is the same: “If you’re worried about your faith, then you have not fallen from your faith. For your very concern betrays that you have not rejected your faith, but instead desire to grow in it.” The people the preacher of Hebrews addresses are those who hate God and show no concern for their sin, not those who desire God and are worried about their sin. This is why the preacher continues: “Even though we speak like this, dear friends, we are confident of better things in your case – things that accompany salvation” (verse 9). In our case, the preacher reminds us, we have better things – salvific things. Salvific things which come from the one who was once paradeigmatizo-d on a cross for us and for our salvation. The promise, then, is that even when we take a giant parapipto into sin, when we trust in God, we can have the full assurance that even if all the King’s horses and all the King’s men cannot, the King can put us back together again. And when he does, we are stronger than ever. For we rest in the strong arm of the one who conquered all – even death on a cross.